Dyalog would like to invite you all to start using the Dyalog Forums, which may be found at http://www.dyalog.com/forum. Ability to handle the input and display of APL characters: We have tested the Forum from the most popular Web Browsers and E-Mail clients, and so far it has handled the input and display of APL characters reasonably in all scenarios (Microsoft E-Mail Clients don't use the requested font but APL code is legible). 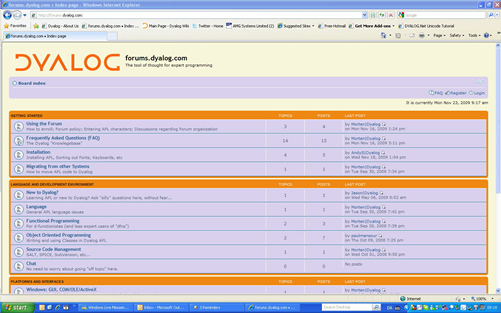 Easy Navigation and Search: The forum is divided into a number of sections, allowing easy navigation and search within the contents. A special "FAQ" section contains Frequently Asked Questions (and Answers). Knowledge Base and Sticky Topics: Forum features like "Sticky" topics will hopefully allow us to make the Forum more usable as a "knowledge base" for new users. Note: It is not necessary to ENROLL in the new Forums in order to READ the information posted – you only need to register and create a user ID if you want to POST new information to the Forums. Those who are members of the Yahoo Group dyalogusers will notice one fundamental difference between the Yahoo Group and the new Forum. Unfortunately it will not be possible to POST to the Forums by sending an e-mail, as it is with the Yahoo group. We appreciate that some users may find this a disadvantage, however, this seems to be a key component of the solution to the problem of entering APL reliably: By accepting input through the Forum web page, we can be sure that we are receiving it correctly. It is possible to READ the Forums using an e-mail client: When you register for the forums you can request a Daily or Weekly DIGEST via e-mail. The digest contains links which you can use to jump to the Forum, browse threads which are active and reply to posts. The Forums do not currently support RSS, but we aim to add this feature within the first few months. We look forward to welcoming you all to the Dyalog forums.